Despite organizers having announced that the Republican convention is postponed due to Tropical Storm Isaac, party stars like New Jersey Gov. Chris Christie are expected to deliver speeches once the festivities begin on Tuesday, a day later than planned. According to Politico, the lineup is so chock-full of state government leaders, such as Louisiana's Bobby Jindal and Florida's Rick Scott, that their presence seems to have overshadowed the Republican presidential hopeful himself, Mitt Romney. If you didn't know better, you might look at the star attractions in Tampa and think you were at a gathering of the Republican Governors Association. Most prominent will be New Jersey Gov. Chris Christie, the RGA vice chairman who's set to deliver the convention's keynote address. 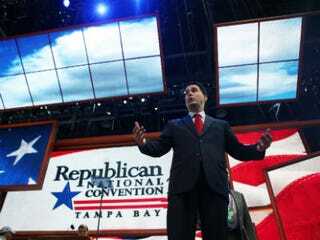 Over the course of the convention's four days, he'll be joined at the podium by a who's who of his fellow governors: including Wisconsin's Scott Walker, Florida's Rick Scott, New Mexico's Susana Martinez, Ohio's John Kasich, South Carolina's Nikki Haley, Louisiana's Bobby Jindal and Virginia's Bob McDonnell, who chairs the RGA. The sheer number of governors speaking is partially the result of Republicans not controlling the presidency. Anytime a party is out of power in Washington, leaders in the states assume a greater level of importance. But several of those governors are political stars in their own right, with one — Christie — heavily pressured to take his own shot at the presidency this year. Others were considered potential vice presidential picks for Romney.